This Whistleblowing Training Course provides information about when and why employees need to report illegal activities from their place of work. This course explains the importance of having a whistleblowing policy and how to protect staff from any abuse or mistreatment during or after they blow the whistle. Providing employees with the right tools and information when it comes to Whistleblowing is essential for an employer to show that they are equipping their staff to deal with any cause for concerns. Protect state that 1 in 10 UK workers said that in the last two years they had witnessed some possible form of corruption, wrongdoing or malpractice. This Whistleblowing Training Course will provide information on what a whistleblower is, the laws surrounding whistleblowers and what constitutes as whistleblowing. 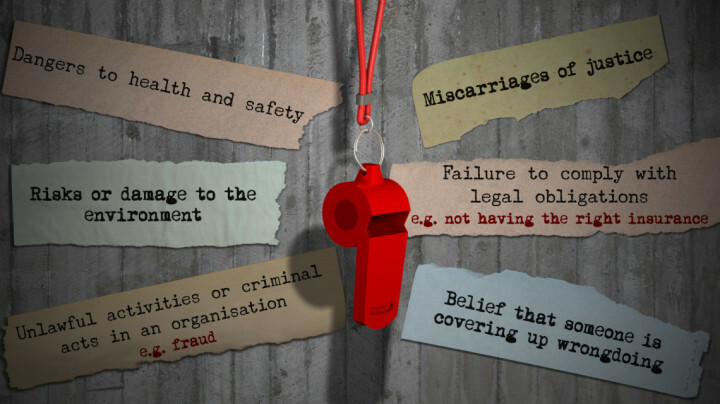 Whistleblowing Training is essential for any organisation so that the correct procedures are in place should someone choose to come forward. There are a number of laws in place to protect Whistleblowers and they were created to support these people if they faced retaliation at work or the threat of dismissal after coming forward. Concerns of wrongdoing within a company can be brought forward both internally and externally. This course will advise employees on what procedures to follow and when you should raise your concerns. Through this Whistleblowing Training, we'll equip employees with the information of what they should do if they put forward concerns to an internal or external party through 3 easy steps. The Whistleblowing Training course is broken down into 3 sections. Whistleblowing is all about calling attention to wrongdoing. Think about a referee in a football match blowing the whistle on foul play or a Victorian policeman blowing a whistle to bring attention to criminal activity. This section will cover what whistleblowing is and what the law is surrounding it. Many organisations have a Whistleblowing Policy. Having a policy means that everyone understands the rules and knows what’s expected of them. It establishes a fair process which is followed by everyone. If your organisation has one, make sure you read and understand it. This section will cover Whistleblowing Policies and how to raise concerns regarding Whistleblowing. Once you’ve made a disclosure and it’s not been made anonymously, you may receive acknowledgement of your disclosure. This depends on your organisation’s procedure or policy. In this final section, we look at following up after you have raised a concern and how employers should handle and store disclosure records. This Whistleblowing Training course concludes with a 20 question multiple choice test with a printable certificate. In addition, brief in-course questionnaires guide the user through the sections of the training and are designed to reinforce learning and ensure maximum user engagement throughout. Your Whistleblowing Training Certificate includes your name, company name (if applicable), name of course taken, pass percentage, completion date, expiry date and stamps of approval or accreditations by recognised authorities. Read our full reviews for Whistleblowing Training. The Public Interest Disclosure Act (PIDA) 1998 is derived from Part IV of the Employment Rights Act 1996. It aims to protect employees while making disclosures in the public interest. These disclosures include evidence of illegal activity or damage to the environment. Furthermore, it aims to protect these individuals should they be victimised for disclosing this information, this legislation could aid them in claiming compensation. For an employee to qualify from the protection of this legislation, they must make a "protected disclosure" to the employer, prescribed person, legal adviser or an otherwise appropriate person. Placeholder image for What is ‘Whistleblowing’?